The new year may have started, but we’re still reeling over some of the stand out exhibit designs from the past year, and it’s not too late for you to take a look too. Many of these booth designs from 2012 are having an influence on the direction trade show booths are headed for the New Year. Let this list of just a few of the best designs from last year be your inspirational guide for 2013. A perfect example of working with what you’ve got, Amada’s booth managed to steal the show… from the back of the exhibit hall! With the wrong design their company could have gone unnoticed at the 2012 Industrial Manufacturing Technology Show. Amada worked with an exhibit manufacturing to design a booth to work with their space. A large fabric projection screen ran across the entire back of the booth and made their projected video and logo visible from any point on the trade show floor, though they were in the back of the hall. However, their design was more than just attention grabbing. 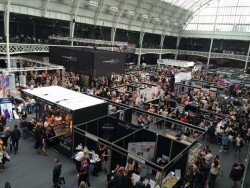 Visitors were invited into the booth with a presentation area as well as a lounge area for refreshments, all surrounded by their products. Ultimately the display pulled the audience in with a punch, and kept them there with a captivating booth design. Any booth can have a beautiful design, but it doesn’t mean visitors will remember it, or the brand. Beautiful booths are a dime a dozen, but memorable booths, those are harder to come by. At the salone Internazionale del Mobile Brunner GmbH achieved a design that was both memorable and creative. Brunner GmbH, a furniture manufacturer, used their products (chairs) to create a splash. High contrast chairs were suspended from the ceiling of the exhibit creating a fun whimsical look that directly related to the company. They also used mirrored walls to open up the space. Their booth captivated visitors, and most importantly they remembered the booth when they left. Sometimes the best thing you can do with your booth design is to keep it simple and clean. This is the tactic Benz Inc. used at the International Manufacturing Technology Show 2012. Their clean, modern design specifically brought attention to their tooling products. Integrated LCD screens played videos detailing the products, and individual pedestals were lit with LED lights to create a futuristic look to the display. The design reflected the company’s future oriented message and helped visitor focus on their products and capabilities. American Fuji Seal exhibited at the PackExpo2012, and went with an open design that was perfect for drawing in visitors. 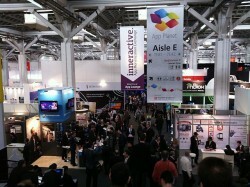 The open space was welcoming, shaped as if it were an entrance to the show floor. To display products American Fuji Seal had simple displays, and used light, fabric based structures to frame the exhibit. Custom rugs were everywhere in 2012, and Fuji Seal’s bright, branded carpet added an extra splash of color to balance out the entire booth. 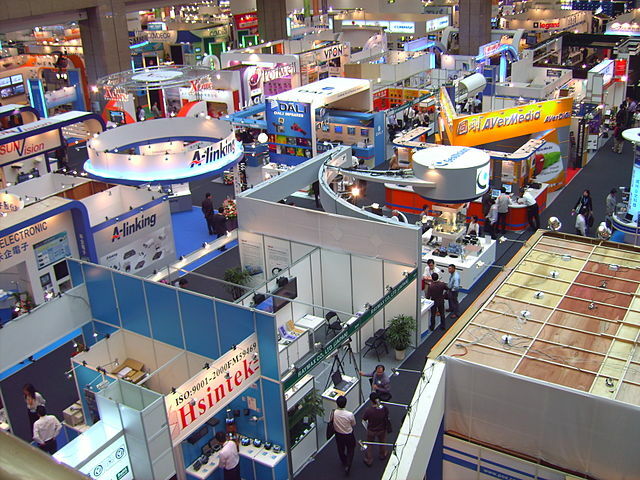 When you think about custom exhibit design, your mind may go straight to the largest, most extravagant booths on the floor. However, Houghton is proof that even a small scale custom display can be refreshing and memorable. Their 10’x20′ exhibit was designed with many of the trends for 2012 in mind. Bright colors, bright flooring and custom rounded counters created a bright and modern look, gaining a large amount of attention with a small booth. How Are Portable Display Units Helping Brands Define Their Presence?